As I look at it now, all the work in the summer heat to get the wood, then pull all the nails, was worth every drop of sweat. I still have a few more pieces left over for the next farm project. This wood will stand up to the steam from the boiling process of making maple syrup. It will make a neat place for children to watch from a safe vantage point, out of harm’s way. The stairs are not steep. Nor do they have big steps for short legs…even Goldielocks would say they are “just right”. It is the little things that keep a farm in the black. Being self reliant is good, but having great friends helps even more. One friend gave me his old pool deck. Another helped me to salvage the boards and still another helped me build the stairs. I have sweat equity invested, a little time, and a trade for my own labor on an upcoming project for my friend. The best part is only three boards had to be purchased for this project, less than fifteen dollars of out of pocket expense. 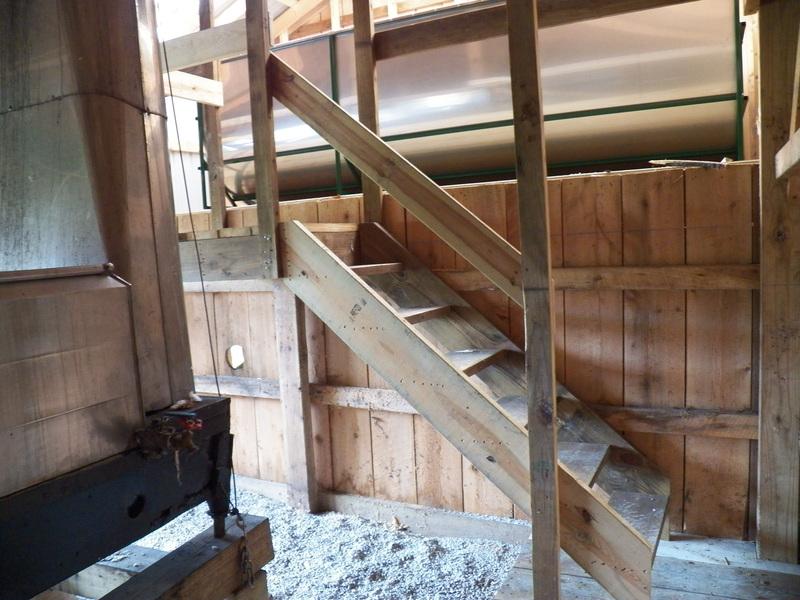 We can all agree that they do not make a stairway to Heaven…but it sure is a Heavenly project. Its not just the stairs, it’s the friendship that makes them so great. The fact that they cost almost nothing…is indeed priceless! 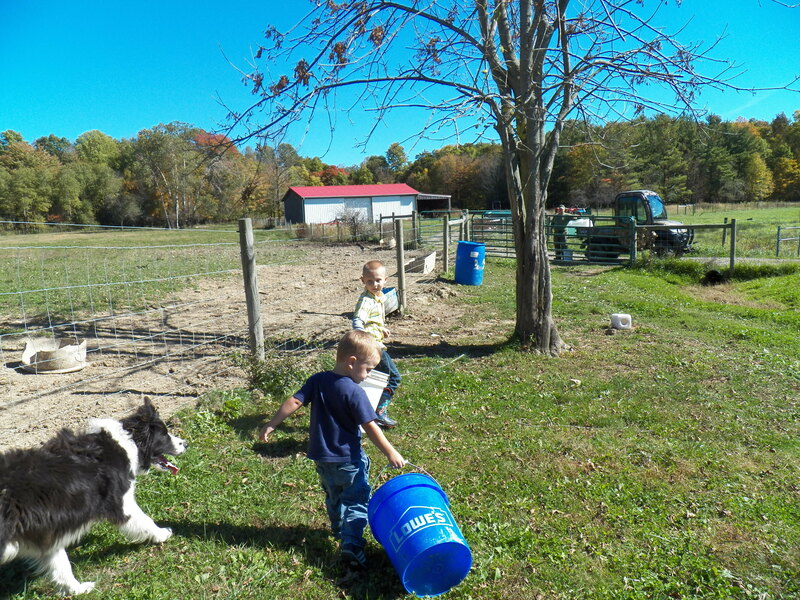 Jackson and Xavier, helping Pa-Pa. Cinch keeping a watchful eye. A big ear of corn looks even bigger in the hands of a child. 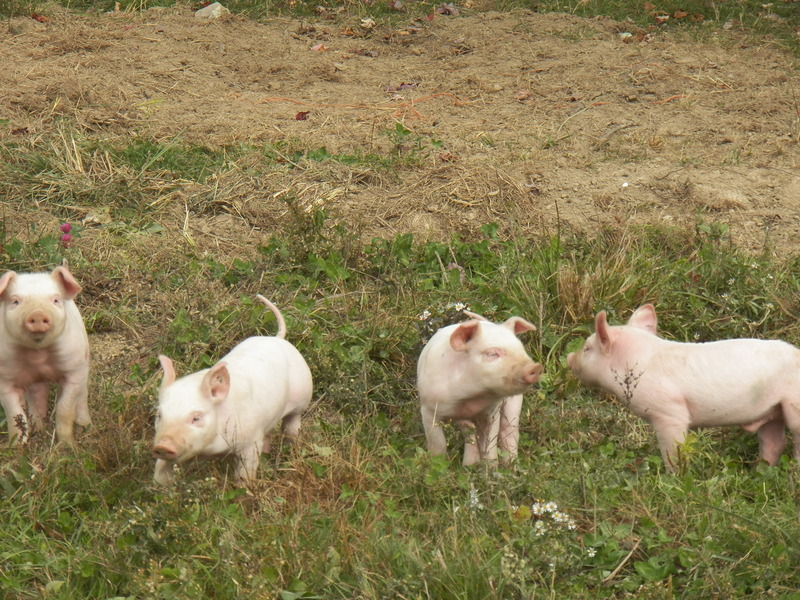 The children tossed the ears over the fence to the delight of the sows. My great granddaughter was a bit shy at first, but she warmed up quick to feeding the pigs. One momma pig has a litter of piglets. The kids sure liked those babies. They got to pet one little squiggly baby who squealed a bit. They children jumped at first, but soon laughter over shadowed the fear. 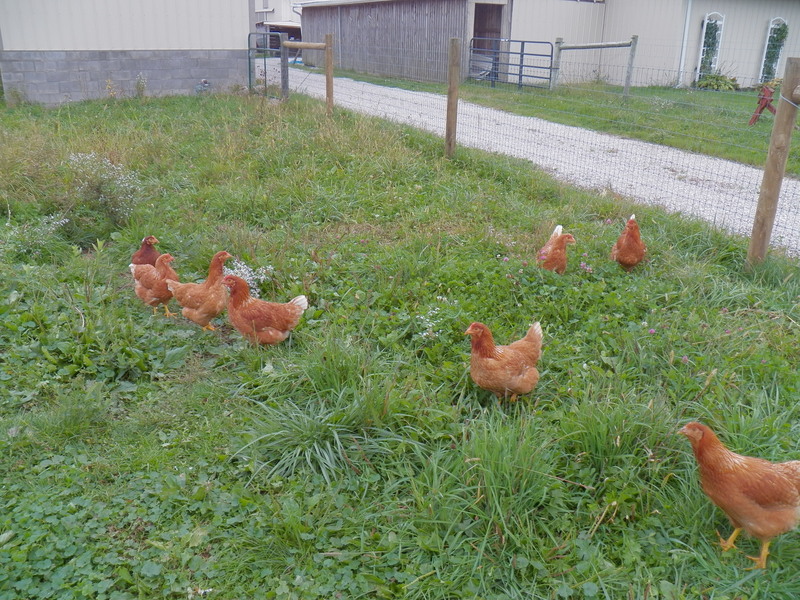 I like this farm, in part because of the little ones. The baby calves, lambs and piglets make me smile. To see one of our grandchildren or great grandchildren delighting in the farm babies, tickles me to the core. When young people make a connection to the farm it pleases me greatly. In fact this is one of the biggest reasons that I do all the hard work that comes with farming…it’s for the little ones! Yesterday, I was closing gates and moving cattle. 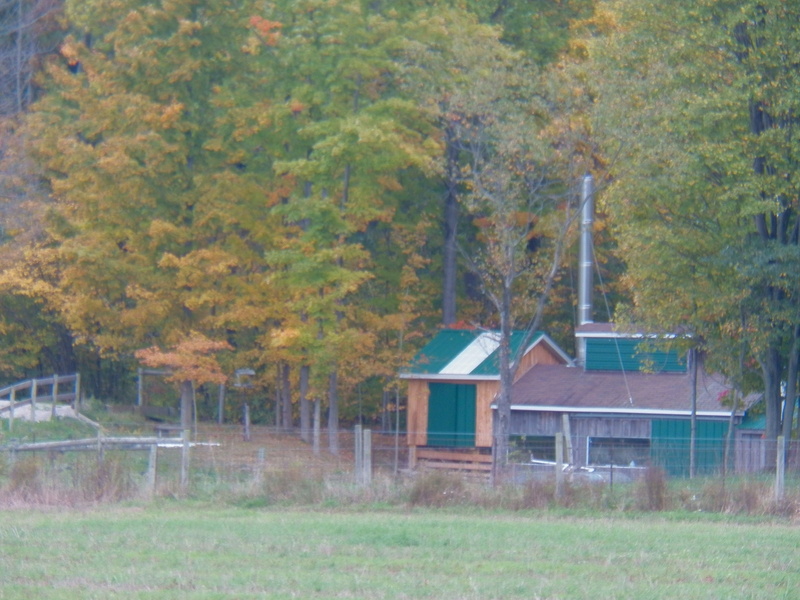 The goal is to put the sheep in the sugarhouse paddock again. The grass in that place is deep, green and lush. The lambs will fatten well on it. The mothers will put on a little extra weight just in time for breeding season. I think the grass is rich enough to “flush” the ewes. Flushing them refers to tricking them to think there is an abundance of feed so they will release more ovaries. They have the confidence that there will be plenty of feed to raise their new babies. Some guys say that flushing ewes is an old wives tale. I know in nature, if deer have plenty to eat in the fall, the does have more twins in the coming spring. I also believe that flushing has worked for me the past fifteen years, so I am not going to quit doing what works. It’s not like I only wear a favorite jacket or socks during breeding season as my ewes head to the playoffs! This is about balanced nutrition. The ewes have access to all they want to eat and drink, along with minerals free choice. This is good husbandry. It’s the way I do business anyway. I think all those sets of twins next spring is the ewe’s way of saying, “Thank you!”. As I was closing gates and moving the stock, I realized yet again just how much beauty was surrounding me. 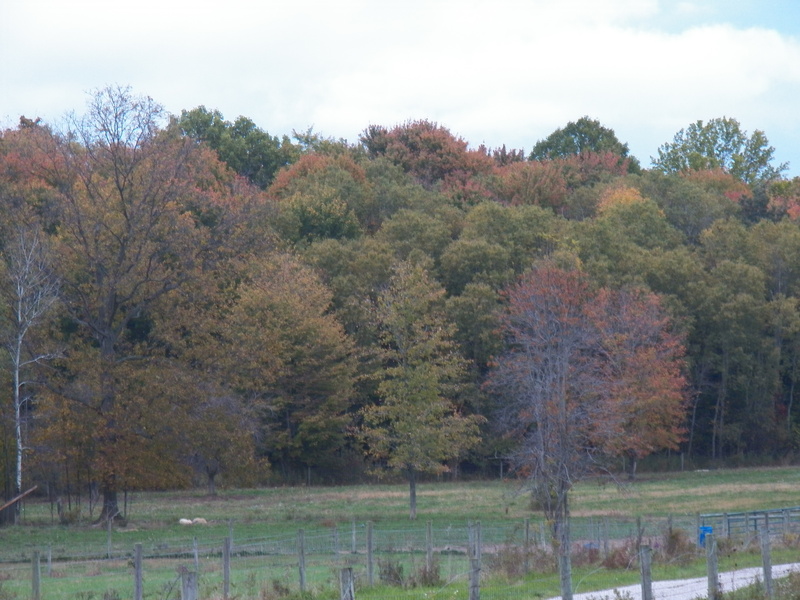 The leaves continue to get more colorful each day. The growing speltz are a bright green and the grass looks like a green carpet that stretches “wall-to-wall”, from fence row to woodline. In fact, it’s just like a walk in the park! 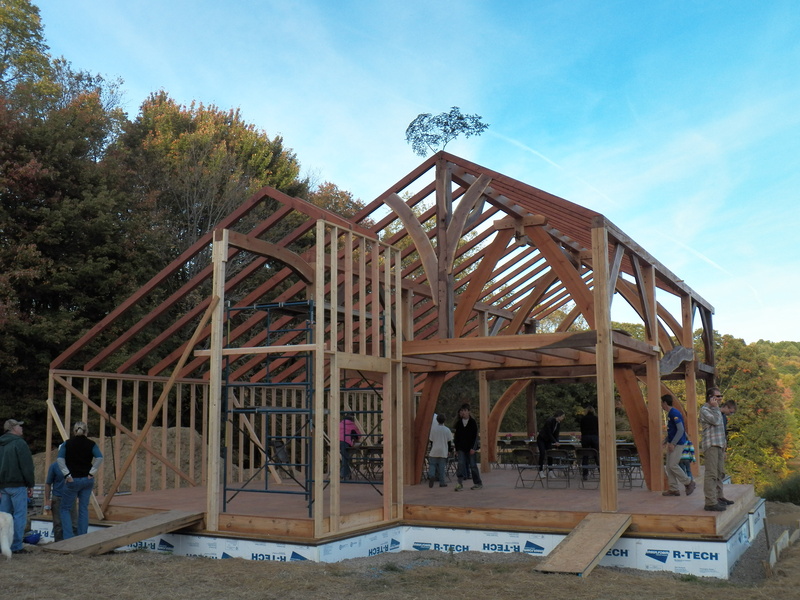 Yesterday, I spent the day watching and helping, as my friend’s David and Margaret’s Timber Framed house was raised. I have seen many things in my life so far, but this experience was a stand out. It will remain in my memory forever. David is a timber framer. He finally got the time and “where-with-all”, to build his family’s home. He selected each tree and each branch, that would become his home. 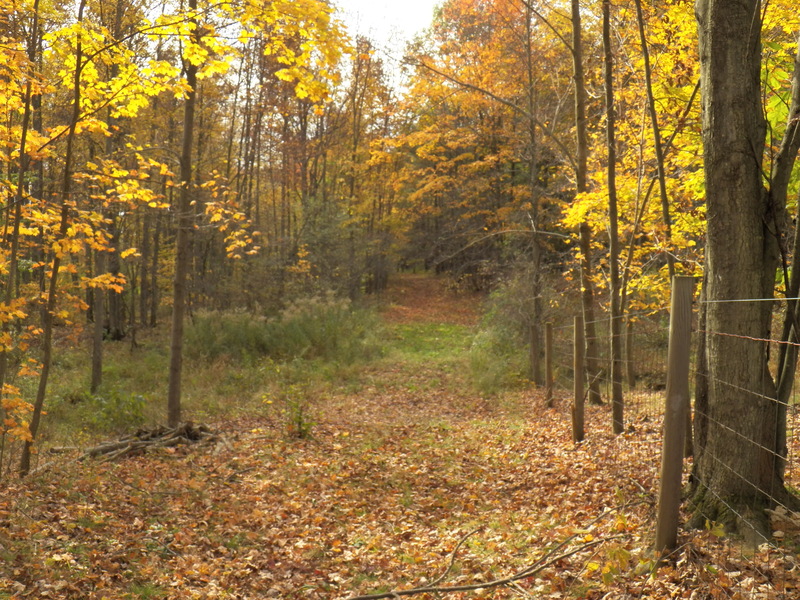 David and Margaret purchased their land with the same goals in mind. They would become stewards of the forest and guardians of the trees. Yes, they would harvest them, but only when the trees are biologically mature. In other words, they would only harvest the dead and dying ones. Once those trees were selected, they would be utilized to the utmost. From lumber to firewood, the entire tree would be used. David has been perfecting his craft for twenty years or so. He is an artist who can see great beauty in the standing tree or the fallen log. The wood almost speaks to him as he fashions mortise and tenon joints. The craftsmanship is remarkable. David selects crooked and curved logs that other’s would discard. In those misfits he finds beauty like no other. The character in those logs are like the inner beauty of a person, A person who has been beaten down, but survived life’s hard knocks and finds good, in every breath they take. The curved wood, when cut into slabs of lumber reveal grain and color that is breathtaking. A curly cherry arch forms the doorway of the homes main entrance. The highlights of the home are curved cherry archways that hold the home’s ridge. They rise up in one area from the first floor, all the way to the second story ceiling. The beauty of the wood and the perfect joinery is a sight to behold. It is a classic case where form is functional. 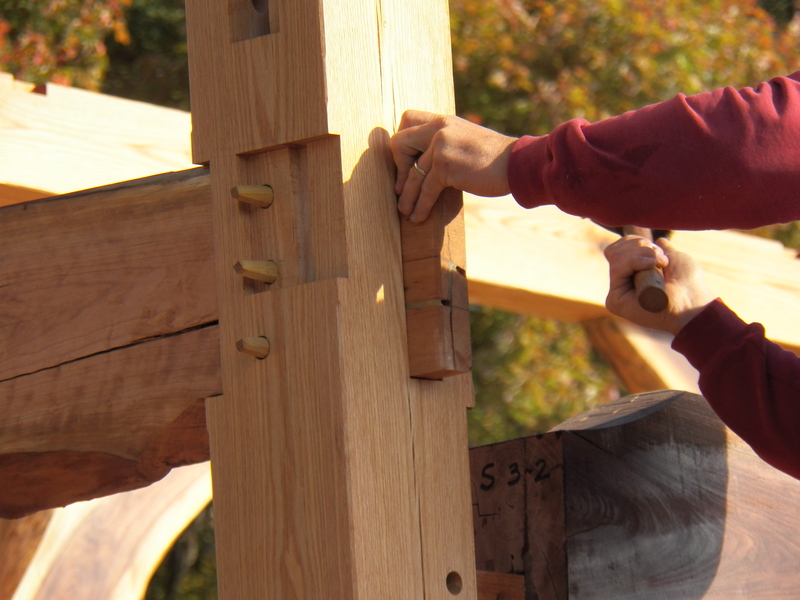 David’s workmanship is as fine as cabinetry, like the beauty found on old ships. His attention to detail is astounding. 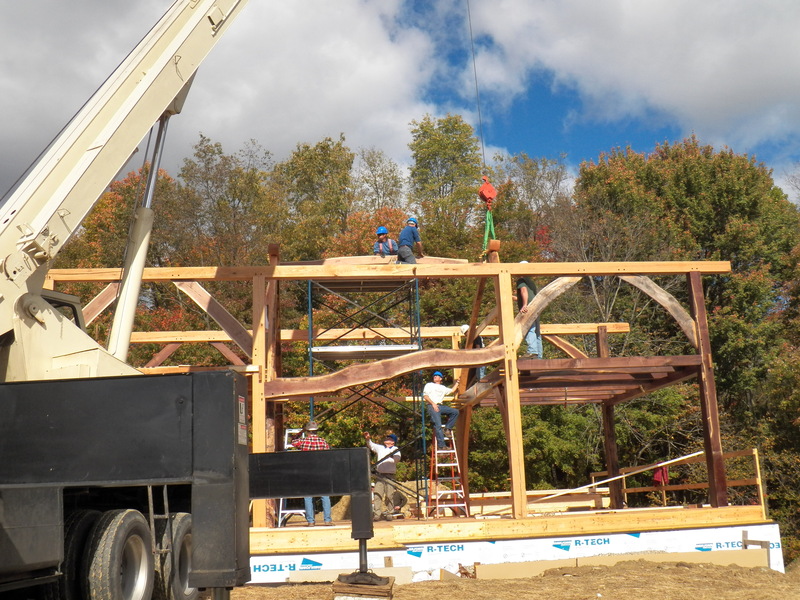 The last touch is to nail a green tree branch to the top of the structure. It shows respect to the trees that made the whole work possible. I found it to be fitting touch to end an awesome day. I am amazed at how well the clover pasture the pigs are enjoying is holding up. There will even be a week or more grazing for our cow herd once I move the pigs to the woods. The woods pasture is doing well. Hickory nuts and crab apples are falling steady. Those woodland treats will be gobbled up by the sows and their babies. They will romp, play and sleep in the fallen leaves. I guess its like one big party before coming in for winter. It sure makes for happy pigs! I will chalk up my tumble to the season. 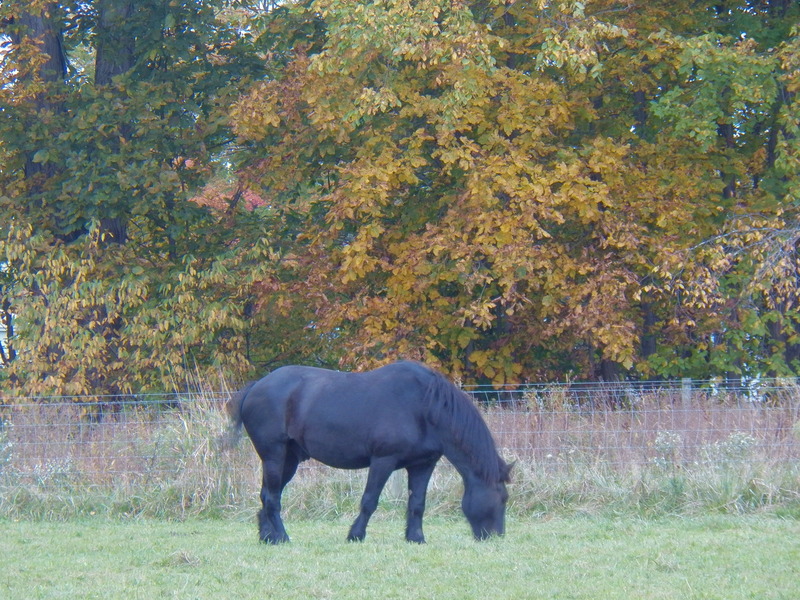 You see in autumn, it’s not only leaves that “fall”…. It’s us nuts too!